Continuing our October spotlight on pro bono, we asked ACBA CEO Tiela Chalmers how pro bono has effected her career. 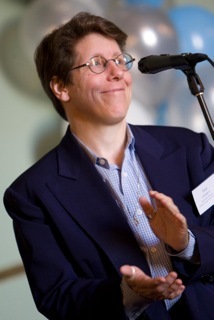 Prior to joining the ACBA and VLSC, Tiela Chalmers worked as a Nonprofit Consultant consulting on a number of projects. She began her career in legal aid at the Volunteer Legal Services Program of the Bar Association of San Francisco where she worked for over 14 years, first as a Supervising Attorney, then as Managing Attorney, eventually leading 30 staff and 1,800 volunteers as Executive Director. One of the remarkable things about pro bono work is the way that its gifts change to fit us at each stage in our career. I handled my first pro bono case in my first year out of law school. The AIDS crisis was at its peak, and I took case after case for men who had been healthy just a few weeks before, and then were handed a death sentence. I drafted wills that left the old green recliner to Aunt Sadie, and powers of attorney that ensured that the dad who had disowned his son would not be in charge of making end-of-life decisions. The work was heartbreaking, and it seemed like so little in the face of tragedy. But my clients were so deeply appreciative, and I felt like I was making a difference. As that crisis lessened, I tried other things. I helped a woman get a divorce from her abusive husband, and witnessed the relief flood her face when it was finally over. I worked with a veteran who was increasingly disabled as a result of his combat duty in Korea, and who needed help negotiating the VA system. I represented tenants who were one court hearing away from homelessness. And I staffed a free clinic where, in just a few hours, we helped people understand their options, and start on the path they chose. At the beginning, everything was new to me – how to handle myself in court, how to work with a client, how to negotiate with opposing counsel. My pro bono cases helped me learn all those things. Later, they were a source of personal reward to me – it was so clear to me that I had offered help where otherwise the person would have had nothing. I knew that I had made a real difference. (I did that with paying clients, as well, but I was pretty sure that if they hadn’t hired me, they would have hired someone else.) And my pro bono clients were so deeply grateful, that it gave me a sense of mattering and being needed that, I think, we all need. I was so moved by these experiences that, after 10 years in a law firm, I took a job with Volunteer Legal Services Program (the San Francisco version of VLSC). Eighteen years later, I’m still working in the pro bono arena, and proud to be affiliated with a program of VLSC’s quality and reputation. And I’m still doing pro bono work – because it matters, and because I want to matter, too. Would you like to get involved? Donate your time by volunteering at one of our legal clinics, or if you don’t have the time, support VLSC financially! Please contact Director of Access Programs Elizabeth Hom with any questions at elizabeth@acbanet.org.